Symantec said the goal is to create a universally accepted identity system across all Web sites -- from online financial institutions to retailers -- for millions of consumers. Symantec Corp. claims a new component of its Security 2.0 initiative will create a universally accepted identity system across all Web sites, helping users manage their online identities in a secure way. The Cupertino, Calif.-based antivirus giant was scheduled to show off pieces of its Identity Initiative Wednesday at the DEMO technology conference in Palm Desert, Calif. The Identity Initiative is a combination of services and software the company calls the centerpiece of the Security 2.0 initiative it launched in October. "Our goal is to create a universally accepted identity system across all Web sites -- from online financial institutions to retailers -- for millions of consumers," Enrique Salem, group president, Symantec Consumer Business Unit, said in a statement. "We have a strong base to build from, with almost half of our active Norton user base already enrolled in a basic Norton account. We'll enable our millions of customers to extend the functionality of their Norton account to manage all their information, all in one place." Mark Diodati, an analyst with Midvale, Utah-based Burton Group, said the Identity Initiative shows Symantec playing to its strengths on the usability and client side. The company has taken a big step forward by bringing the single sign-on concept closer to the consumer market. But he's skeptical of Symantec's claim that this is a universal solution. "I wouldn't say this is universal," he said. "This works for PCs, but it can't easily be used with mobile devices. You can't take [the feature] with you." The Norton Identity Client is designed to provide consumers with online credentials and give them protected access anywhere they transact on the Internet. The online identity credential will be similar to how a passport or driver's license functions in the physical world; but could be modified as needed and accepted virtually everywhere, Symantec said. Provide consumers with information on a Web site's reputation and trustworthiness based on technology and data from Symantec's research and Security Response Labs. Ensure the safe use of personal information. Work everywhere, interacting with Web sites supported by different identity exchange protocols such as CardSpace and OpenID. 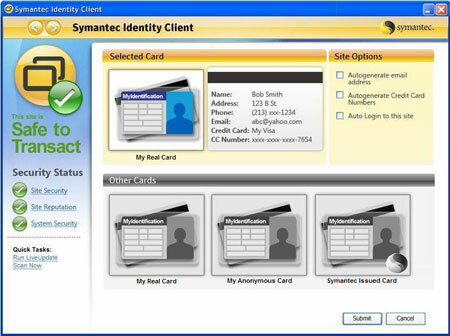 Symantec expects to roll out its Identity Initiative worldwide over the next 12-24 months. Even without formal partnerships, the Norton Identity Client will be compatible and functional with the majority of Web sites, the company said.